Now, it’s not hard to figure out where the goodness in this loaf is from. 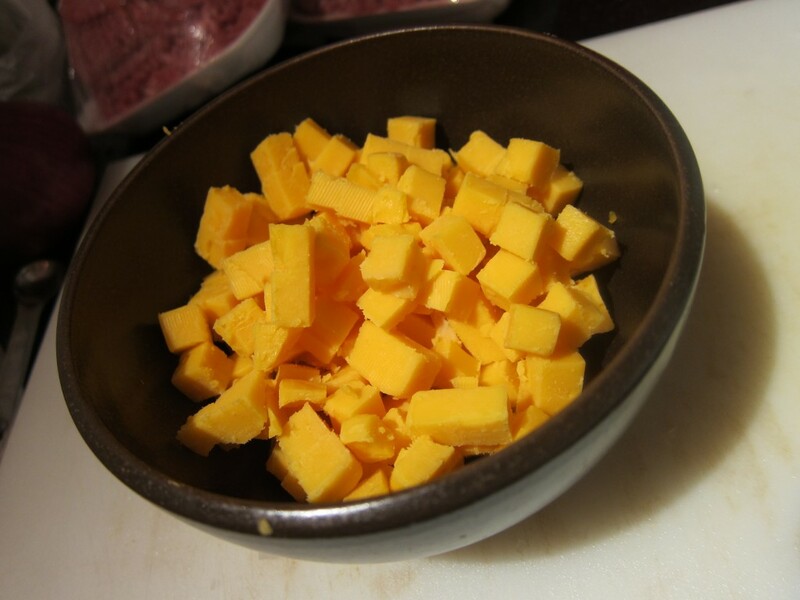 This bowl says it all: diced cheddar. 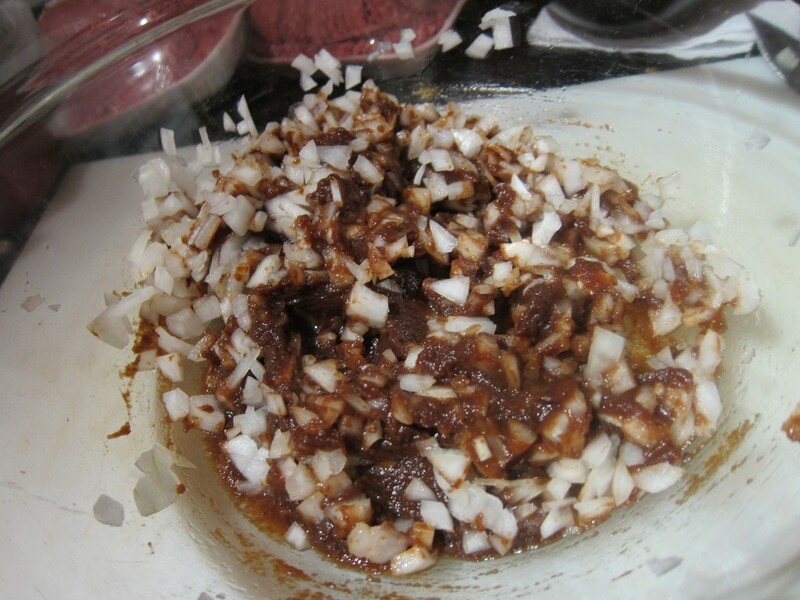 Before you get to the cheddar bit, though, you mix up the rest of the ingredients — apple butter, onions, breadcrumbs etc. 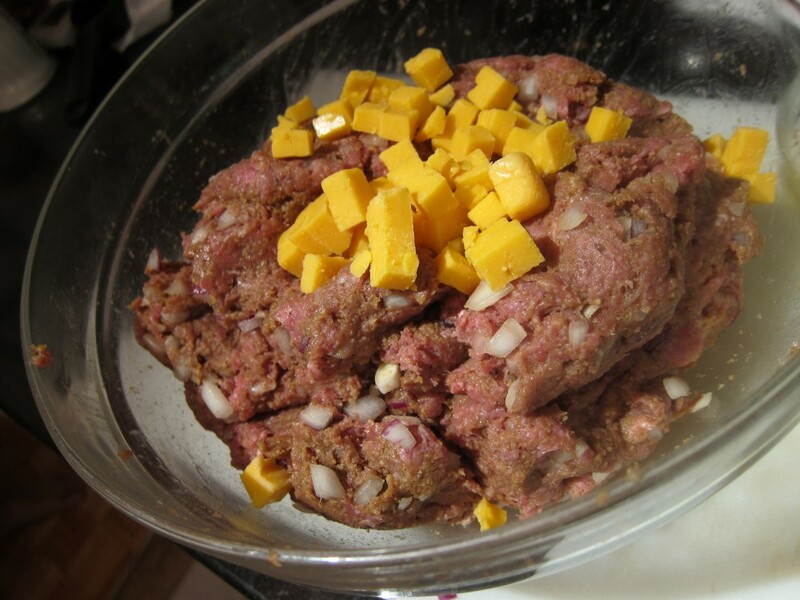 — in a bowl, add ground beef and make sure everything’s thoroughly combined. Then in goes the cheddar and once that’s nicely worked in, the loaf goes into the oven. It’s that easy. So how did it taste? About as good as you would expect a combination of apple butter, cheese and ground beef to be — in a word, delicious. If you like chunky pockets of cheese then this recipe is perfect as is. But I might try it again with grated cheddar instead as I’d like to see how it tastes with the cheese incorporated into the meat mixture a little more. Since Russ was so kind as to give me his recipe, I’ve decided to spread the love and share it with you below. I’m still on the hunt for more meatloaf recipes, however — so if you have a favorite, let’s hear it. In return, I’ll be doing my first giveaway on this blog. Here’s the deal: If you share your meatloaf recipe with me in the comments below by end of day (New York time) July 16, I’ll enter your name to win four big packages of gourmet steak jerky from Umpqua Indian Foods, whose jerky I fell in love with after sampling it at the Fancy Food Show in Manhattan last summer. The flavors you’ll get include beer, black pepper & garlic and jalapeno steak jerky. Trust me — it’s good stuff. So, do share below and I’ll announce the winner in mid-July. a loaf. Bake in a shallow pan for one hour. This entry was posted in Meat, Recipes, So Good It Must Be Bad For You and tagged A Tiger In The Kitchen, Apple Butter, Beef Jerky, Book, Cheddar, Meatloaf, Onions, Steak, Umpqua Indian Foods by Cheryl. Bookmark the permalink. Since having kids, I now understand why my mom loved to make meatloaf. Though, it’s so good, I don’t know why I didn’t try it before then! Oh, I forgot to finish the thought–I just use Mark Bittman’s basic recipe. Baked not in a loaf pan but on a sheet pan to let the fat run off. My mother-in-law’s uses a version with oatmeal that has a nice texture. LOVED the book…too bad it came out after I went to Singapore, oh, well, now I have an excuse to go back. My mother makes her meatloaf with oatmeal, too. I was skeptical, but it really does make a tender, not tight meatloaf. Her recipe is basically 2 lbs. ground beef, 2/3 cup Heinz ketchup, a couple of grinds of black pepper, a dash of Worcestershire sauce, 1 envelope Lipton’s beefy onion soup (I used caramelized onion, don’t tell her), 2 eggs and about 1/2 cup of oatmeal (not instant). I use one of those meat loaf pans with drainage holes. bake at 350 for about an hour. I’m up to page 192 of your book! I’m enjoying reading your memoir. Thanks for sending me the book. I am no longer at Yaddo. I have a new job at the Roosevelt Baths. It has been an interesting change. 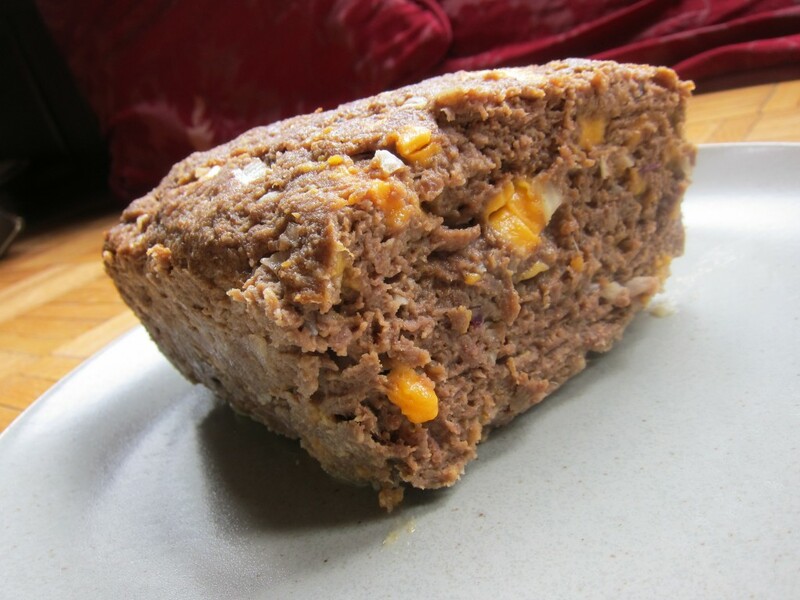 This meatloaf is one of my favorite recipes to make. The same recipe also makes good meatballs which makes everyone (almost) in my family very happy that I like to cook. Lightly saute onions, garlic and red pepper. Combine sauteed vegetables with meat, Italian Seasoning and bread crumb mixture. Put into a 1.5 qt. bread loaf pan. Bake in a 350 oven for 1 ¼ hours. Drain excess fat. Combine catsup, sugar, and mustard; spread over meat. over it all. Next, I whisk up a few egg yolks and pour that directly on top of it all and put the lid on top of the saucepan. Continue cooking (not stirring any of the ingredients) until the egg mixture is cooked. You can dish this out on a bed of rice in a single bowl, and pour some of the juices on the top of it. Enjoy! Oh MY…this sounds delicious! I can’t wait to try it. Thanks for sharing…and hope you’re enjoying the book! Thank You for the ongoing excellent read! I have been checking in on your blog frequently, and I really love your reviews on the different eateries you have encountered. Much fortune to you! Fantastic recipe! We often bake Gorgonzola into meatloaf. The apples are a new twist we’re going to have to try. I adore gorgonzola…will have to bake that into the next meatloaf I make!